Miranda Shane has a secret - an online identity building a massive following creating poems using a Scrabble board. The idea came to her one evening, after moving into her newest apartment, when an aging and unused Scrabble box kicked the bucket spilling tiles that spelled "poem" onto her floor. And for a poetry teacher, currently blocked in her writing, no sign could be clearer. But as that part of her life begins to come into focus, her love life takes a complicated turn. The one that got away, so to speak, is back in her life. And so is a hot Irish grad student. 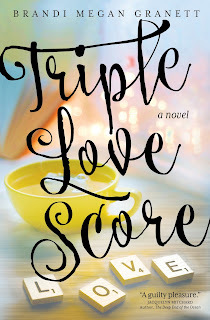 If you're looking for a fun story full of heart just in time for the holidays, Triple Love Score is definitely the book for you. The book begins in the days just before Thanksgiving with Miranda Shane looking for an excuse not to go home for the holiday. Not that she'd skip, but the promise of seeing a man she'd pined over most of her life who then vanished without as much as a goodbye six years ago is enough to make her hop a plane to any location other than home! But just as the dreaded reunion becomes a reality, a grad student begins making a play for Miranda. And in a moment of weakness, she finds herself open to the idea. Triple Love Score is a sweet read with a touch of poetry and a bit of steamy romance as well. For more on Brandi Megan Granett and her work, you can visit her website here. You can also like her on Facebook and follow her on Twitter and Instagram. Good morning, readers! 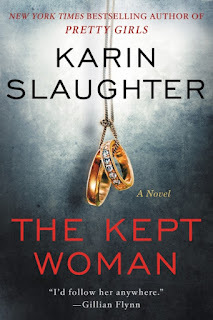 Today I'm a stop on the TLC blog tour for Karin Slaughter's latest, The Kept Woman. Will Trent's morning is about to get ugly. He and partner Faith have been called to the scene of a murder - an ex-cop's murder to be more specific. The scene: the currently-at-a-standstill construction site that is to be a star basketball player's future night club. Said basketball player's club has been held up thanks to Trent's most recent case, pursuing allegations this player raped and assaulted a woman at a New Year's party held in his own home. And yet the amount of money and lawyers on the side of the player have almost permanently squashed any validity on the victim's part. The case is a literal mess from the start. The empty building is full of evidence, most of it likely unconnected considering it appears to have become a den for junkies as well as a hang out for Atlanta's homeless. And while there's plenty of blood on the scene, it seems very little of it is from the victim. But when a gun found nearby traces back to Trent's own wife, things get really messy. This latest in the Will Trent series is TWISTED! I've read enough of Slaughter's work that I should expect that by now, but that doesn't mean I was in any way prepared for the surprises The Kept Woman kept throwing out. Fortunately, for me and any other readers who may be reading Slaughter out of order, The Kept Woman does work fairly well as a stand alone. I'm certain there are details about Will's background and relationships with coworkers and significant others that would be beneficial to know, but I was comfortable enough with the amount of history that was laid out in this particular installment that I never felt like I was wandering lost in the wilderness of the tale with no idea what was going on. Will and his wife have, apparently, a complicated history. They're split and Will is involved with another woman (has been for quite some time) but they're not officially divorced - in spite of Will's efforts. And as it turns out, Angie (the wife) has been keeping tabs on Will in a way that definitely disturbs his current GF Sara. From the start, the investigation splits in two directions: the discovered victim and Angie. The ex-cop, dirty by all accounts, had been selling himself as a PI with possible connections to the building's owners. But digging into the victim's history leads to a rabbit hole of bizarre and disturbing information. Meanwhile, Angie is deemed to have been injured quite badly (based on the amount of blood at the scene) that she couldn't possibly survive for long. And yet, there's one key piece of info the reader knows that the investigators don't: she wasn't the only other person at the scene! Like I said, full of surprises! As for the twisted part, well you'll have to discover that yourself. Trust me, if you're ok with dark, this is one that will keep you reading into the wee hours and/or dropping all your commitments to get to the end! Their father is dying. He's returned home to stay with his middle child who purchased the family house from him a few years ago. Together they've got a routine, a plan of sorts for his final days. And as each of his other children pays their final visits, tension between the siblings runs high. The middle daughter longs for the quiet and peace that will come with their leaving as her father's end draws nearer. Because, she believes, his end will bring about a wondrous sight. Something she's witnessed just twice before. Something that's come for her in her darkest moments. The Language of Dying is an odd one to sum up. It's about grief. It's about families. It's about the relationship between parents and their children and relationships between siblings. And it's about, I think, the magic of hope. Whatever your take away is from this slim book, I guarantee it's one you won't escape without experiencing a serious range of emotions. To that end, it's something of a painful read. It's a read that's certainly stayed with me since I finished it. And it's a read that, I think obviously by this review, I've had trouble compiling my own thoughts about. Sarah Pinborough has long been a favorite of mine, even though I've yet to read through all of her current body of work. 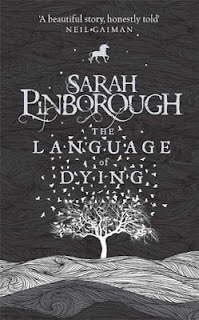 The Language of Dying is like nothing I've ever read by her. Yes, it's all her - writing, style, pacing... - but I've only delved so far into her straight up horror. This is definitely not horror. Or at least not in the most traditional sense. Grief can be horrific. The way the various siblings deal with losing their father certainly illustrates that. Two of them can't, or won't, cope at all. One offers up the expected support. And another even surprises our narrator. And while our narrator puts up a good front for her father, she does eventually crack a bit under the pressure, letting loose some emotion she's kept bottled up for quite some time. Through all of this, though, the narrator longs for something she's kept mostly secret. It's this secret that allows her to live through the grief she feels. The expectation that this, one of the worst moments of her life, will bring magic. As I said, a hard one to sum up. An odd one for sure, but one that very obviously shows what a massive talent Sarah Pinborough is! Happy Saturday, readers! I hope you all had a fabulous reading week - I know I did. Sort of. After forcing myself to DNF a current YA darling (which was admittedly good, when I could get to it), I decided to treat myself to some shorts. I was a good decision as this was definitely one of those weeks where manuscripts, other work stuff, and general blah-ness left me in need of short, punchy reads. And boy did I get what I asked for. I've sung Ellen Datlow's praises here quite a bit. Behind the scenes, because I haven't talked much about it yet, I've been reading A LOT of Lovecraft inspired works. 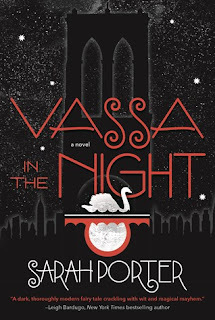 Tor.com has THREE new or upcoming novellas in this vein (in addition to Victor Lavalle's release from earlier this year). And hubs recently treated me to three Innsmouth inspired collections as well. So I'm absolutely steeped in Lovecraft - or rather Lovecraft-inspired reads these days. BTW, if you're interested you should check out this fabulous interview with Kij Johnson, Cassandra Khaw, and Ruthanna Emrys about their new novellas, Lovecraft, etc here. So, back to topic. 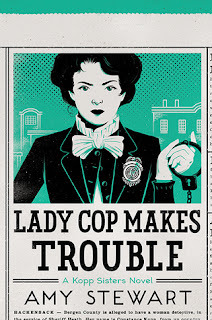 Datlow has done Lovecraft before, but when I saw that it was the topic of her newest anthology (timely!) I immediately had to have it. I know by now that I can count on Datlow for a fabulously cultivated collection of weird tales by authors I either already love or will come to! Children of Lovecraft was, of course, no exception. 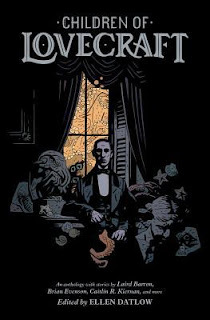 The premise of the anthology is this: the authors were tasked with writing Lovecraft-inspired shorts using, as Datlow states, the best of Lovecraft, while also exploring new themes and horrors. And boy did the authors to just that! From the Dust Bowl to a tale inspired by Boulder's recent epic flood, most of the stories don't explicitly use any Lovecraft specific creations - Cthulu, etc - but instead are imbued with the eerie and terrifying ambiance of Lovecraft. And yes, plenty of bizarre creations and creatures as well! 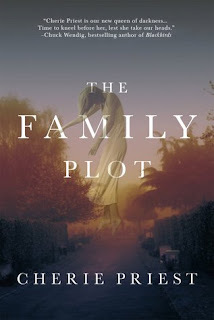 A few of my personal favorites include Siobhan Carroll's "Nesters" - a truly creepy tale made more so by being set during the desperation of the Dust Bowl, Richard Kadrey's procedural-esque "The Secrets of Insects," A. C. Wise's gory and disturbing "When the Stitches Come Undone," Brian Hodge's "On These Blackened Shores of Time" the aforementioned Boulder flood inspired tale (set in Pennsylvania mining country), and Brian Evenson's "Glasses" - oh, Brian Evenson's "Glasses"! This was kind of a delightful one - a bit of comic relief, so to speak, amidst what could be a quite unsettling collection! In truth, though, I quite enjoyed the whole anthology. It is a perfect one to treat yourself to if you're craving weird and scary! And probably the best part, you don't have to know Lovecraft at all to enjoy it. You do have to love horror, though. Breezy doesn't remember dying. She doesn't remember being buried either. But she knows she was under ground for a year when the first man she killed dug her up. Since then she's made her way haphazardly across the country, hitchhiking when she can and skateboarding when she can't. And it's ok, because Breezy can see the shadows that haunt killers. Oh, and she apparently can't die. Because Breezy is no longer completely human. Kali Wallace's debut is fun, y'all! And dark. 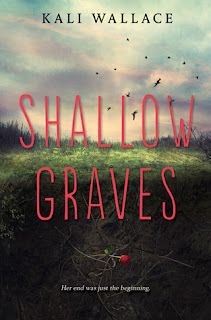 The world of Shallow Graves is packed with monsters, human and otherwise. And it's the former who are the big problem. The latter live their lives quietly among us, passing as much as they can for "normal." Witches, ghouls, you name it... well, maybe not unicorns. And then there's Breezy. Breezy is something else. Something no one can quite explain. And while she can't die, doesn't need to eat, and doesn't even need to breathe, Breezy does need answers. The story is set roughly two weeks after Breezy wakes. As mentioned above, she knows she's been dead for a year but she has no memory of what happened. Nor does she know why she was dug up, why all the birds died that day, or how the man she killed even knew where to find her. She knows she can't stay in her hometown. So she travels, aimlessly. And while hitchhiking might present problems for a normal person, Breezy is doubly safe. Not only can she not die by any obvious means (she's tried), but she has the ability to see the human monsters around her. The killers who drive and walk the streets she's traveling. But Breezy isn't actually as safe as she believes. Apparently in her reality there are people who want to rid the world of its monsters and monsters who would help them in their efforts. Reading along as Breezy tries to find out what she is and what her purpose might be is fabulous. I loved her as a character - she felt authentic and substantial. The kind of character who comes to life on the page in such a way that you think you could almost recognize them if you were to cross paths with them in the real world. And there was an added layer to that authenticity for me thanks to the setting. Pieces of the story are set in Boulder, Colorado, and I found myself oddly trying to place the vaguely mentioned people and locations as I was reading. It was almost as though I could run into Breezy and Zeke and Jake strolling down Pearl Street one day and I needed to be prepared! I know that's an element that most people won't have in their reading. It happens, though, that books are set in real places and readers can recognize those places. It happens seemingly less often for me than you might think - my hometown and college town are both small enough that they lose out to larger Louisiana cities for the most part when settings there are chosen. Here in Colorado it's less odd but still fun when it happens! Anywho, I quite enjoyed Shallow Graves, if you couldn't tell. It's a great debut and a satisfyingly dark and quirky read! Music City Salvage can't really afford the deal being offered on Withrow mansion, but the promise of salvage that could finally earn them some cash is too good to pass up. And so, Chuck Dutton decides to risk everything to make it happen. Dahlia Dutton is well aware of the fact that the job at Withrow can literally make or break the family business. And so, when things start to turn strange, she's ready to brush it off and get the job done. It's just a week, after all, and everyone sees ghosts at these old places. But as she and the crew continue, things become not only weirder but potentially more dangerous. Ghosts haunt a graveyard said to contain no real graves, another specter lives inside the mansion itself terrorizing the crew increasingly as the week passes, and then there are clues found around the estate that seem to indicate not all is on the up and up with the Withrow family history. 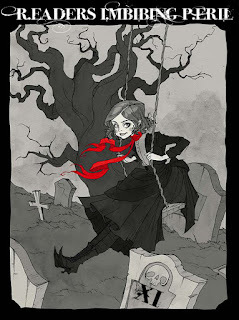 I love Cherie Priest's horror. It's what introduced me to her work - her Eden Moore trilogy, that is. So I was definitely stoked to see her return to those roots, so to speak. The Family Plot never quite reached the same level of creepiness as Four and Twenty Blackbirds. But it was a quite fun outing anyway. Inspired by reality tv salvage shows, the book features a Nashville salvage company hired to gut an old estate near Chattanooga, Tennessee. They're told the house features chestnut flooring, marble fireplaces, and more - details that definitely start owner Chuck's mind working. With unpaid accounts out there, the business is already in trouble but the promise of chestnut alone, a wood lusted after in the salvage community, is enough for him to say yes to the job. A job two other companies already turned down. Dahlia is also risking everything, she can't afford for the family business to shut down especially now that she's divorced and living on just her income alone. Her salary barely covers her rent but the loss of it would be a serious detriment. So you have a family business that has sunk everything they have left into one job that HAS to pay out, or else. Of course they're going to ignore any ghostly visions. And they trust, based on years of experience, reality ghost hunting shows, and stories amongst the industry, that nothing bad is going to happen to them regardless of how many ghosts they encounter. And of course that decision gets them all in trouble! I have to say this particular element - the fact that they all believe in the possibility of ghosts and that they even refer to ghost hunting shows and such as proof that nothing bad will happen was extra fun. 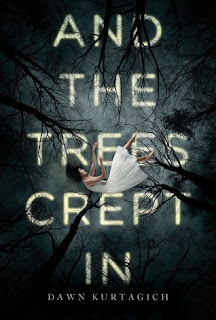 You don't have to be a fan of reality tv to love Priest's latest, but I would definitely say that you have to be a fan of haunted house books! Good morning, readers! 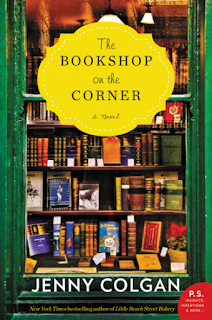 Today I'm a stop on the TLC blog tour for Jenny Colgan's latest, The Bookshop on the Corner. Thanks to budget cuts, Nina Redmond is out of a job. And it's a job she'd loved, working as a librarian and pairing readers with the perfect book for any situation. With her apartment bursting at the seams with books, Nina knows she has to do something. And so an idea is formed: a bookshop. Not just any bookshop, a mobile bookshop. 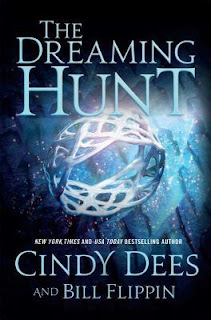 But realizing the dream turns out to be much more complicated than Nina would have thought! It felt almost indulgent to dive into this one. It was such a comforting and welcoming read - a feel good read for sure, but more than that as well. I felt a kinship with Nina and an admiration for her. As hurdle after hurdle was thrown at her, I rallied alongside her waiting to see if and how she'd conquer each challenge and if her dreams would really come true. Colgan's humor is infectious. That sweet whimsy mentioned above, paired with enough giggle worthy moments definitely helped in making this a book I could get lost in. And I wouldn't be lying if I said that I was a little envious of Nina's adventure as well! The Bookshop On the Corner is such a fun read, sheer entertainment packed with heart and books! Because I loved this one so much, I want to share it with you, fellow readers! To enter to win a copy of your own, simply fill out the Rafflecopter below before Monday, October 3. Open US only. 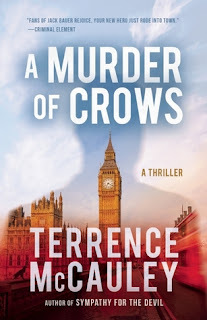 Thanks to Polis Books, I happen to know today's guest post writer was in attendance signing copies of his latest, A Murder of Crows, the second in his James Hicks series, which released this July. For years, every intelligence agency in the world has been chasing the elusive terrorist known only as The Moroccan. But when James Hicks and his clandestine group known as the University thwart a bio-terror attack against New York City and capture The Moroccan, they find themselves in the crosshairs of their own intelligence community. The CIA, NSA, DIA and the Mossad are still hunting for for The Moroccan and will stop at nothing to get him. Hicks must find a way to keep the other agencies at bay while he tries to break The terrorist and uncover what else he is planning. In my spy thriller SYMPATHY FOR THE DEVIL and A MURDER OF CROWS, I’ve been fortunate enough to have readers tell me they’re not sure if they like my protagonist James Hicks, but they’re very interested in his colleagues Roger Cobb and Tali Saddon. I’ve known a few writers who didn’t like it when secondary characters seemed to be as popular or resonate more with their readership. I happen to love it. Every bit of feedback I’ve ever received has helped me become a better writer one way or the other. So when I hear that they’re interested in learning more about the co-stars of my work, it means I’ve done my job as a writer. I’m not just writing about one character doing brave or heroic things. I’m creating a world in which the reader can lose themselves for a few hours. A place where they can invest their time and money to escape their everyday world while they explore the one I have created for them. From a plot perspective, I think secondary characters are very important. They can enhance the action and advance the plot so the protagonist doesn’t have to do it all on his or her own. They can show aspects of the protagonist’s character without the writer having to spell it out in detail. It affords the writer the opportunity to show, rather than tell. Let me explain. Since I write mostly thrillers, I do my best to try to do something different that separates my work from other books in the genre. One set piece expected in spy novels is the obligatory exposition of the protagonist’s past. It often takes place when a secondary character is reviewing the protagonist’s file. There we clearly learn all of the protagonist’s skills and accomplishments. The medals he has won or the demons she’s trying to fight from a bad op gone wrong. It’s an easy way to convey a lot of information about the protagonist quickly and it’s a device I try to avoid at all costs. Although the reader certainly needs to know about the protagonist, but I chose to hint at it rather than have two characters discussing what they’re reading in a file. James Hicks is the protagonist of my University Series of novels and I intentionally keep his past vague because it adds to the overall covert, secretive nature of his work. I have decided to show how capable he is not only by what he does, but how the secondary characters react to him. Roger Cobb mentioning an op they ran in Africa or Roger being concerned about Hicks’ temper. Tali saying she can’t trust Hicks because she knows how he operates. The Dean of the University discussing Hicks’ strengths and abilities rather than having him review his file with a third party. These secondary characters aren’t just window dressing. They contribute to the plot and convey a sense of who Hicks is and his capabilities. His strengths and weaknesses are reflected in their reactions to him, which allows the reader the chance to fill in the blanks on their own. 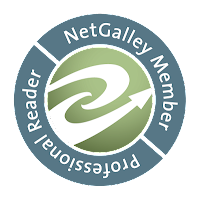 Given the feedback I’ve received from my readership, I’m pleased with the results. After SYMPATHY came out, I heard from readers who wanted to see more of Roger Cobb. They wanted to see more of Tali and see her in action. They wanted to learn more about the Dean’s plans and how the University might change in future novels. That feedback helped me craft the sequel – A MURDER OF CROWS – where those same characters play vital roles in how the plot unfolds. It is a tactic I will employ in the next book in the series and in all of my writing in the future. Because strong secondary characters not only make the protagonist more interesting, they add another layer to the plot that keeps the reader invested and engaged. Creating interesting secondary characters is yet another part of the art of writing that I thoroughly enjoy. About the author: Terrence McCauley is an award-winning writer of crime fiction. 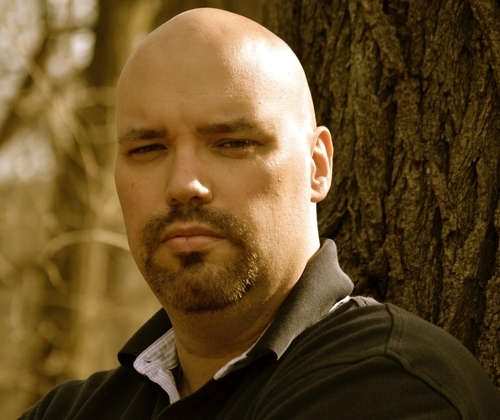 His first techno-thriller, SYMPATHY FOR THE DEVIL, was published by Polis Books in July 2015. Polis also reissued Terrence's first two novels set in 1930 New York City - PROHIBITION and SLOW BURN. In 2016, Down and Out Books also published Terrence's World War I novella - THE DEVIL DOGS OF BELLEAU WOOD. Proceeds from sales go directly to benefit the Semper Fi Fund. A proud native of The Bronx, NY, he is currently writing his next work of fiction. Big thanks to Terrence McCauley for being here today and to his publicist for setting up this post! For more on Terrence McCauley and his work you can visit his website here. You can also like him on Facebook and follow him on Twitter. Whether you've read Seanan McGuire's Every Heart a Doorway yet or not (and why haven't you, by the way!? 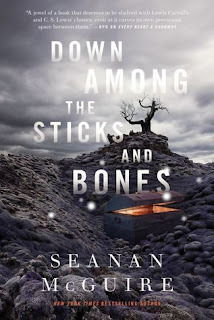 ), you should be excited about its follow up, Down Among the Sticks and Bones. It's about Jack and Jill! You know, of hill and water bucket fame! We have quite a while to wait for this one since it's not due out until June, but that's plenty of time to go ahead and read its predecessor in the Wayward Children series if you haven't yet. Go ahead, go buy it. You won't regret it. McGuire is brilliantly creative and Every Heart a Doorway proves that in spades! For Silla and Nori, the stories about their mother's childhood home have always been just that: stories. Fairy tales almost. But Silla, planning ahead, managed once to get her mother to share a map. A map that would take her and Nori to their salvation one desperate evening. The manor may be crumbling, but it lives up to Silla's hopes. At least for a little while. Their aunt welcomes them and coddles them, but warns them ominously that they must stay out of the woods. As time passes, though, Silla's aunt disappears into the attic of the old home, leaving the girls to fend for themselves. And Silla notices that the woods have begun to grow ever so closer to the house. I turned the final page of Dawn Kurtagich's latest with more than a little bit of that what-the-heck-did-I-just-read feeling. It's an odd one, to be sure. And part of the oddness of it made it somewhat easy for me to figure out what was going on. And the Trees Crept In is a weird one. Anyone who read The Dead House might have some idea, but I'm not sure anything can truly prepare you for this one. And I have a feeling that folks are going to either love it or hate it. 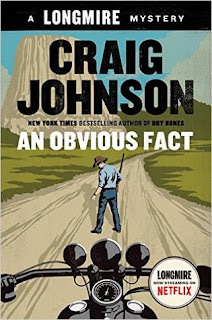 I have to be careful here because I don't want to spoil anything, but this is definitely the kind of book that will have you either rereading to find what you missed, or (as I did) flipping back and forth once you figure it out. I will say this, Dawn Kurtagich has once again surprised me and provided an excellent (and creepy) escape from mundane reality. And oh, that reality remains mundane! It makes reading stuff like this so much more fun. Good morning, y'all! 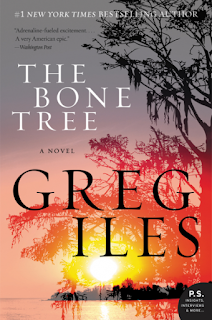 Today I'm a stop on the TLC blog tour for the second book in Greg Iles's Natchez Burning trilogy - The Bone Tree. I have to defer to the official cover copy here for my synopsis today - I'm beat and short on time, readers! Ugh. Warning: Possible spoilers ahead if you haven't yet read Natchez Burning! The Bone Tree picks up right where Natchez Burning left off. Penn's father is on the run and Penn and Caitlin have narrowly escaped the fire at Brody Royal's house. Meanwhile, FBI agent John Kaiser, who has now officially labeled the Double Eagles a terrorist organization, is determined to see justice done and the group held responsible for their crimes. It's clear to me exactly why so many readers and writers love Iles's work. Even Stephen King blurbed the series! The plot is so carefully and intricately built with wonderful attention paid to every little detail. These are smart books and, as further evidence to just how smart, they're easy to read. Easy in terms of being completely sucked in, that is. The story itself deals with a very dark aspect of our (ongoing) history. The Bone Tree is another doorstopper like it's predecessor. But like Natchez Burning, this second in the trilogy continues the almost breakneck pace set by Natchez. And yes even though there is a tiny bit of a recap in the prologue, you do need to read - at the very least - Natchez Burning before diving into The Bone Tree. Hi, everyone! Today I'm a stop on the TLC blog tour for D. M. Pulley's The Buried Book. Nine-year-old Jasper Leary has been abandoned by his mother. They took off one day, her telling him little more than that he was going to visit his uncle's farm for a while. She told her own brother little more, just that she wanted him to take care of her son and that she would be back. But as the days pass, and she doesn't come back, Jasper starts to fear the worse. And so Jasper begins to snoop and listen in when he isn't supposed to, all in an attempt to find out why his mother left him. Apparently Althea is in some trouble. Trouble Jasper can't quite understand or figure out. But it's trouble that has the cops and some very unsavory characters searching for the missing woman. And yes, as it turns out, she is missing. Her car is discovered abandoned and even her husband has no idea where she might be. D.M. Pulley's latest pits a nine year old against mob bosses, bootleggers, and murderers as he searches for clues about his mother. One of those clues is the book mentioned in the title, a diary his mother wrote when she was just a teen, found hidden in the burned shell of her childhood home. I have somewhat mixed feelings about it. On the one hand, I liked the mystery and the suspense of the tale. I was invested in Jasper's story and wanted to find out the truth about his mother. On the other hand there was something that kept me from really loving the story. 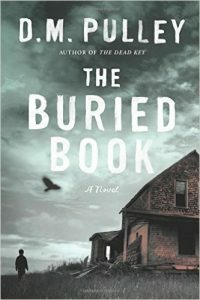 In the end I think it was simply that I wanted more from The Buried Book. The heart of the story concerns organized crime, racketeering, murder, and a history of violence and secrets all set in 1952. But, because our narrator is a nine year old who barely understands many of these details, they're not delved into as much as I really might have liked. Admittedly this limited viewpoint is something I do generally enjoy, but in this case I think it just didn't completely work for me. Which again is not to say that I didn't like the story as written. Jasper's innocence does, at times, mean that the reader has to become a bit of a detective as well. It's never unclear what's happening but there are times when you're left to wonder about the more I mentioned above. All in all, The Buried Book was a good read. It's piqued my interest in a few of the topics brought up as well, which means I may just seek out some things to satisfy my curiosity. For more on D. M. Pulley and her work you can visit her website here. You can also like her on Facebook and follow her on Twitter. Yep, that's right. Today, what would be the beloved author's 100th birthday, is Roald Dahl Day. In honor of his birthday, there's a fun online party pack you can download with lots of activities and such. There are also some brand spanking new editions of Dahl's classics available in bookstores right now! 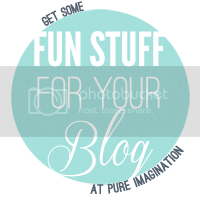 To celebrate I have some fun goodies to share! There is a HUGE giveaway for a collection of selected Roald Dahl titles (new editions, all), and I even have a great quiz for you as well (which can also be found in the party pack). 1. Who eats and entire chocolate cake in front of the whole school in Matilda? 2. What Happens to the Twits' furniture in The Twits? 3. What is Willy Wonka's pink boat made of in Charlie and the Chocolate Factory? 4. In Matilda, what is Matilda's father's job? 5. In The Enormous Crocodile, what does the Notsobig One eat? 6. What is the name of the monkey in The Twits and The Enormous Crocodile? 7. In James and the Giant Peach what outdoor chore is James doing while Aunt Sponge and Aunt Spiker drink lemonade? 8. What are Matilda's parents called in Matilda? 9. What does the Enormous Crocodile crash into at the end of The Enormous Crocodile? 10. Who is Miss Honey's aunt in Matilda? 11. Which Roald Dahl story does Danny's father tell him at the beginning of Danny, the Champion of the World? 12. In Charlie and the Chocolate Factory, what berry does Violet Beauregarde turn into before she is taken to the "juicing room"? 13. In The Enormous Crocodile, who flings the Enormous Crocodile into space? 14. What is the name of Mrs. Silver's tortoise in Esio Trot? 15. How does Mt. Twit catch birds in The Twits? 16. In Danny, the Champion of the World, what does Doc Spencer give Danny to eat? 17. What does George make his medicine for in George's Marvellous Medicine? 18. What is the name of the company the Giraffe, Pelican and Monkey work for in The Giraffe and the Pelly and Me? And be sure to check back here Friday for the answers to the quiz questions! Happy Monday, readers! 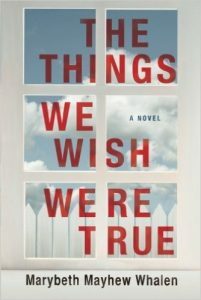 Today I'm a stop on the TLC blog tour for Marybeth Mayhew Whalen's latest, The Things We Wish Were True. It's summer time, the kids are out of school, the local pool is open, and the local gossip is making the rounds. An old neighbor has returned, stirring up long forgotten feelings, and a new neighbor almost drowns. It's that near drowning that draws Lance, Jencey, Zell, and Bryte together. It's also the incident that becomes a catalyst for change and revelations - some good and some bad. Jencey left the neighborhood years ago. She left behind her boyfriend, who is now married to her best friend, and started fresh. But now that her husband has been arrested, Jencey finds she has nowhere else to go. Bryte doesn't want to worry about Jencey's return. She and her husband love each other and are even considering a second child. Well, her husband is considering. Bryte is considering going back to work instead, something she hasn't yet told Everett. Zell's kids are grown and gone but she feels a kinship with neighbor Lance, who's wife has left him. Her offer to help with his kids over the summer isn't completely altruistic, though: she feels responsible for his wife's leaving. And then there are Cailey and Cutter, the two new kids in the neighborhood. Renters amongst a bevy of owners, their mother works all the time leaving the kids to fend for themselves. Cailey looked away for just a second. Just a minute where she played with the idea of having friends of her own. And that's all it took for Cutter to nearly lose his life. There are a lot of characters in The Things We Wish Were True. As chapters alternate between them, we realize that (like any neighborhood) things are not as rosy as they might appear on the outside. Behind closed doors, there are secrets stirring. The biggest, for me, were Jencey's reason for leaving, Zell's connection to Lance's wife leaving, and the subtle mentions of a missing girl. The Things We Wish Were True is certainly, you can probably tell from my synopsis, a very character driven story. We all know how I fell about those. And yet this cast of characters did appeal to me quite a bit. It was easy to want follow their stories, Cailey's in particular. 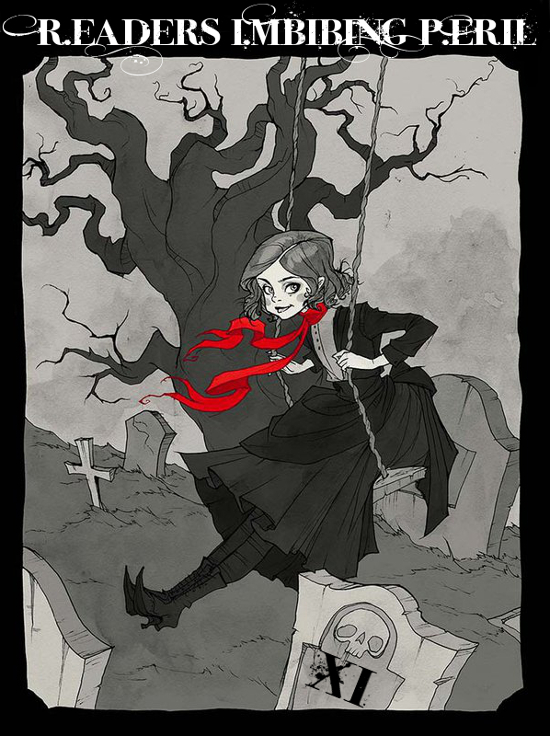 And while I wouldn't call this book dark by any means, the hint of something menacing was, of course, a draw for me as well. For more on Marybeth Mayhew Whalen you can visit her website here. 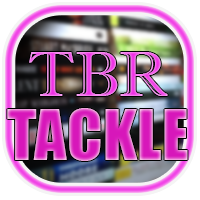 You can also find her at She Reads, like her on Facebook, and follow her on Twitter. I got a fair amount of reading done over the holiday weekend, likely do to two big factors: hubs went camping so I had the house to myself AND I chose pretty much all thrillers. Ruth Ware's latest was my third read of the weekend and, thankfully, it didn't break my stride or my streak of fabulous book choices! Lo (Laura) Blacklock has been writing for Velocity magazine for ten years and has been waiting all this time for her big break. With her boss currently out of commission, it seems Lo's chance has finally come. The Aurora Borealis, a high-end luxury cruise ship built for just twenty passengers at a time, is making its debut voyage and Lo is to be there to represent the magazine. But just two days before she's set to leave, Lo's house is broken into. Lo doesn't want to let the incident rule her life - the invasion was bad enough, but she wasn't physically harmed - so she sets off for the trip as planned. But on her first night on board, Lo believes she witnesses a woman being thrown overboard. Lo of course reports the incident, believing the victim is the very girl she met in cabin 10 earlier that day. But cabin 10 is supposed to be empty. What's more, there's no evidence anyone was ever in the room and all of the passengers and crew are accounted for. The head of security placates Lo, but doesn't hide the fact that he believes she imagined the whole thing. It doesn't help when Lo's own attack and her lack of sleep in its aftermath are revealed. Now it's up to her to find out the truth, but even Lo has begun to wonder if she really saw what she thinks she saw. Pretty early on we know that things aren't going to go well for Lo. Each section ends with correspondence, articles, and theories about where Lo is. Apparently, just a few days into the trip Lo's work and family realize that she's not been in touch and begin to raise warnings. But we do learn that for whatever reason the wifi has been out on the ship, too. Lo's investigation becomes more and more desperate as each day progresses, with just enough to bolster her conviction that she did indeed witness something terrible. Something she soon realizes she shouldn't have. Because as her investigation progresses, Lo begins to suspect just about everyone on board could have been part of the crime that's being covered up. I quite enjoyed the book. 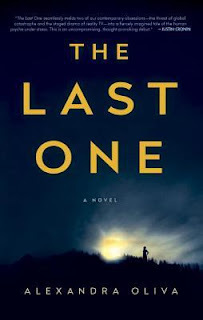 I expected a twist, some big reveal, and it left me suspicious of everyone just as our main character was, with one caveat - I was, at times, suspicious of Lo! There's a bit of a The Lady Vanishes feel to The Woman in Cabin 10, which I have to say I did greatly appreciate. Mind it is just a bit - maybe an homage to rather than a strictly inspired by. 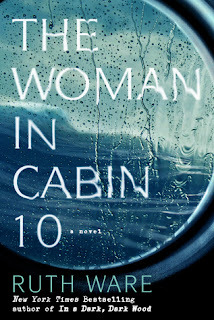 Either way, The Woman in Cabin 10 is a fun thriller and one that's put Ware's In A Dark, Dark Wood on my immediate to read list now too. Twelve contestants have been chosen for a brand new reality show called In the Dark. They know it's a survival based show. They know they'll be cut off from the outside world. And they know they're competing against one another to win. What they don't know is that the show doesn't end until only one of them is left. They also don't know that the world around them is fighting for its own survival as a mysterious illness begins attacking and killing off much of the population. Zoo, dubbed so by the production team, is one of ten remaining contestants at this point. She's been following the clues - blue, as per her bandanna color - but hasn't seen any of the others for some time. She also hasn't seen the host, her cameraman, or any other crew, but she knows they have drones for filming. She expects it's all supposed to make the show more dramatic, kind of like the dead body she and Waitress and Rancher came upon on their last team challenge. That one didn't look as real as the one Zoo came upon by herself, though. After coming so far, Zoo is determined to win. And she thinks she knows where she's supposed to head next. 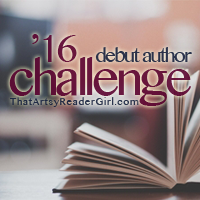 Alexandra Oliva's debut rocked my world, readers! I loved the concept - reality show contestants stuck playing a game they don't know is essentially over as a viral apocalypse wreaks havoc on the real world. I also loved the execution - chapters alternate between the production of the show, with details like how the editors will cut certain scenes to build the characters their contestants are meant to represent, and Zoo's present chapters as she fights to win. Of course the game is over but Zoo has to use all of the skills she's learned to survive day to day. We see exactly how the initial misunderstanding occurs and how Zoo convinces herself everything that happens to her is still part of the show. All of it meant to bring in ratings and viewers. All of it spiraling further and further beyond what you'd imagine you yourself would believe in her position. And yet, it's understandable that a person would rationalize the things Zoo sees. How else could she - or anyone - stay sane? I adored this book. 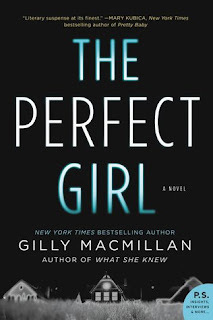 It hit all the right notes for me - it was suspenseful and dark but also had a bit of humor to it as well (I know a little about what goes on behind the scenes of reality tv already, but seeing it in a book is that much more amusing and snarky). And of course it's basically an apocalypse tale, which we all know is right up my alley! The Last One is going down as a favorite of mine for 2016. I highly recommend to anyone in search of a quick and tense read that's also got a fair bit of emotional depth. Fair warning, it's also pretty dark! It's September and that means (in Colorado anyway) that fall bite is in the air and I'm craving MORE horror. More and more. Always. So it's a good thing that September also marks the start of R.eaders I.mbibing P.eril XI! Peril the First - read any four books of any length in the above genres. I don't have a finalized list yet but I guarantee I'll be reading Amy Lukavics's The Women in the Walls and Gina Wohlsdorf's Security. 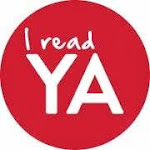 Peril of the Short Story - which of course is reading shorts in the above genres (I've got my eye on the new teen anthology Scary Out There (edited by Jonathan Maberry). and Peril on the Screen - which is, you guessed it, watching movies that fall under the above genres. Libby Strout is famous, and not in a good way. Known as "America's Fattest Teen," Libby became known nationwide when video of her being cut out of her house by emergency crews went viral. But that was years ago and Libby is better now. She's lost weight, enough so that death is no longer imminent, and she's happy. Happy with herself and her body. Happy enough to brave the halls of Martin Van Buren High as a junior. Everyone at Martin Van Buren High knows Jack Masselin. He's popular and well-liked, confident, and goofy. But it's all a show. Jack has prosopagnosia, or face blindness. And he's carefully cultivated his persona to cover the fact that he literally can't tell one person from another. It's a secret even his own family isn't privy to. But then Libby and Jack are thrown together thanks to an awful prank. And it turns out that the two of them share a connection neither expected. A connection that blossoms into something more as they come to know one another. I love Libby. Love her! Teen years are hard enough without being the subject of a viral video. Acne, awkwardness, puberty, confidence issues, bullying... you name it, teens suffer from it. And Libby's problems began when her mother died. Her father tried his best, in spite of what the media claimed a few years later, but for Libby there was a hole in her world that could never be filled. But Libby is strong and confident in a way that draws people to her. Even on the first day of school, when she has to wonder how many of the classmates remember who she is, she doesn't let it deter her. Jack is one of the cool kids and all too aware that his problem makes him different. And different is the very last thing you want to be as a teen. He excuses his missteps with jokes and even drinks (the party at the start of the book) and does a good job of not letting his situation slip. It's worse because Jack's dealing with some tough issues at home too - namely the discovery that his father was having an affair. Oh, and that his dad narrowly survived cancer. That's a big deal for Jack. How can he be angry at someone he almost lost? From the start, though, Jack decides to tell Libby his secret. Yes, it's to smooth the blow of what he's done to her. And yes, their socializing is forced when they have to spend time together in a conversation circle for detention and weekends together doing "community" (school) service. But it's clear that Jack admires Libby and literally sees her for who she is. Readers, I suspected from the opening letter from the author that Holding Up the Universe was going to be a hard read and a tearjerker. I was convinced. As it turns out, that actually wasn't the case at all. Libby and Jack quickly wormed their way into my heart, and I read the book straight through in one sitting. Sure I misted up a bit - but because it was a sweet story rather than a downer! Highly recommended - Libby and Jack (and Jennifer Niven) will capture your hearts, I guarantee! 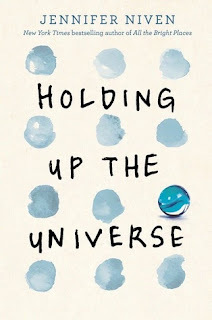 Holding Up the Universe is due out on October 4.